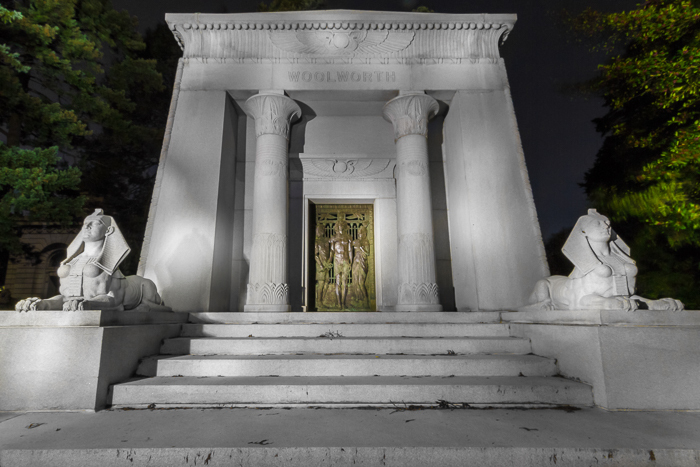 "Monumental Death"- Light painting of the Harbeck Mausoleum on the grounds of the historic Woodlawn Cemetery, Bronx, New York. Harbeck is one of the largest and most ornate mausoleums on the grounds. Canon 7D, Tokina 11-16mm f/2.8 lens, ISO 200, f/11, 30 seconds. As usual with my light painting, this image is built up from several separately light painted images, allowing me finer control over the final image and the ability to produce several different interpretations from one relatively short session. Those who follow the blog, or my work in general, will know that in addition to all things nature, I have a passion for night photography. I love combining nature and night photography, but I'm also not adverse to photographing more "human" subjects at night, particularly with light painting techniques. In the past few weeks, I've had the opportunity to get out with members of my camera club and do (and teach) some more architectural-focused night photography. "Hitchcock Church"- This architecturally interesting Presbyterian church in Scarsdale, NY was the site of a night photography workshop session for my camera club. After the instruction was over, I just couldn't resist taking some images for myself. Canon 7D, Tokina 11-16mm f/2.8 lens, ISO 100, f/8, 2.5 seconds. This exposure uses only ambient light. I thought I'd share with you a few of my favorite images from those outings. 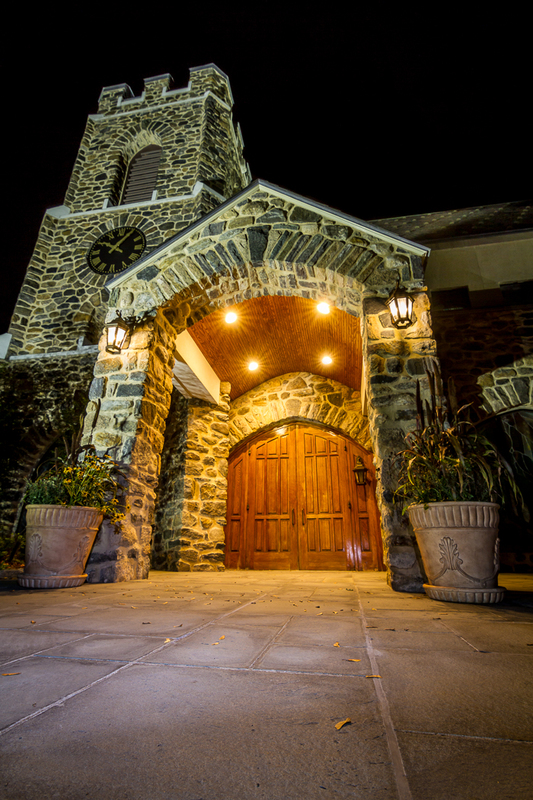 A few of the images are from Hitchcock Presbyterian Church in Scarsdale, NY. This was the site of the "hands-on" portion of a night photography workshop run by my friend Peter Nagy, which I assisted with. The rest of the images are from Woodlawn Cemetery in the Bronx, during a club night photography field trip also organized by Peter. 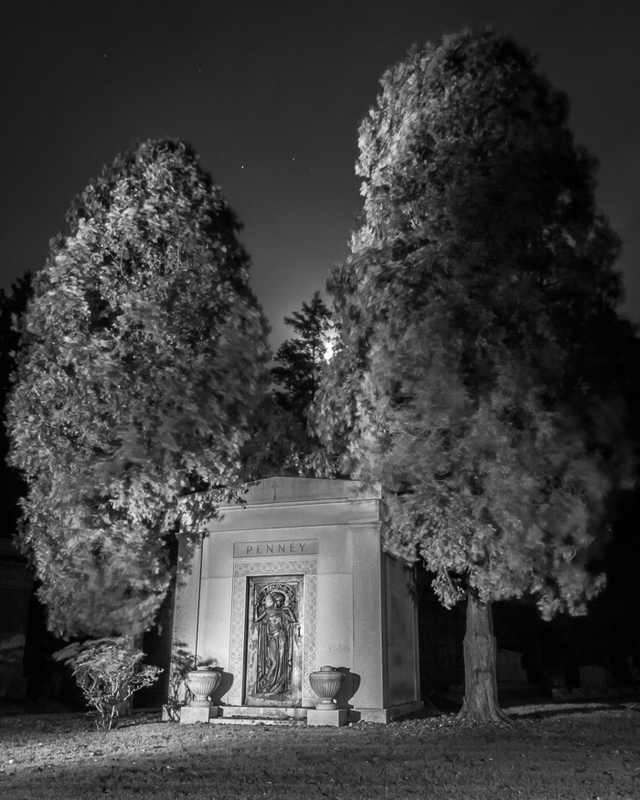 "Moonlight Repose"- A small mausoleum with a beautifully ornate door nestles under trees backlit by the full moon. 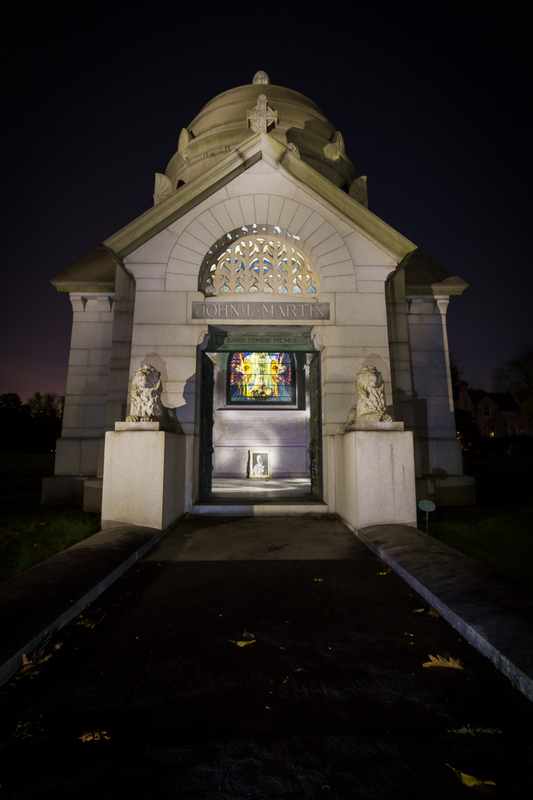 The mausoleum and trees were painted with a flashlight. The blurring in the trees is due to fairly strong winds that evening, but I kind of liked the effect in this case. Canon 7D, Tokina 11-16mm f/2.8 lens, ISO 200, f/16, 30 seconds. 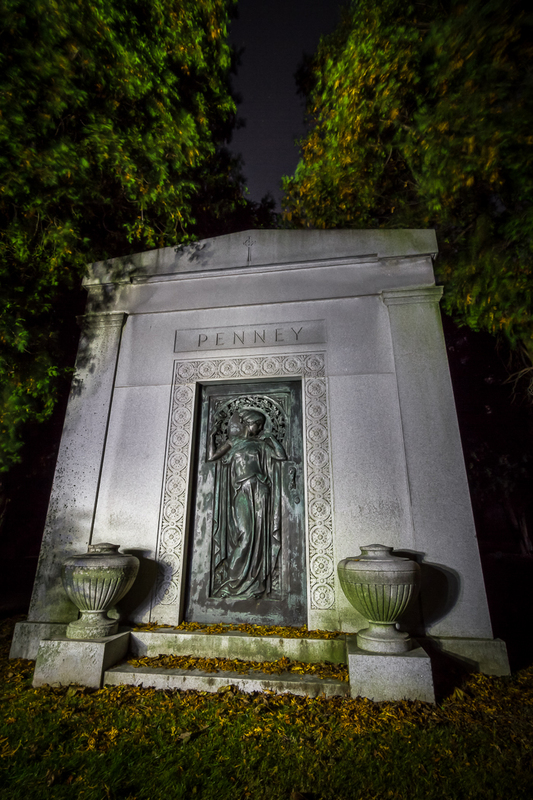 Woodlawn Cemetery is a night photographer's wonderland. Full of fascinating and historical mausoleums and grave markers. We were photographing for close to five hours, yet I barely scratched the surface of the available subjects. I can't wait to get back and do more. "Illumination Within"- Many of the mausoleums at Woodlawn include gorgeous panes of stained glass, such as this one which was opened for our group. Canon 7D, Tokina 11-16mm f/2.8 lens, ISO 200, f/16, 30 seconds. Often my night photography inspires other creative endeavors. 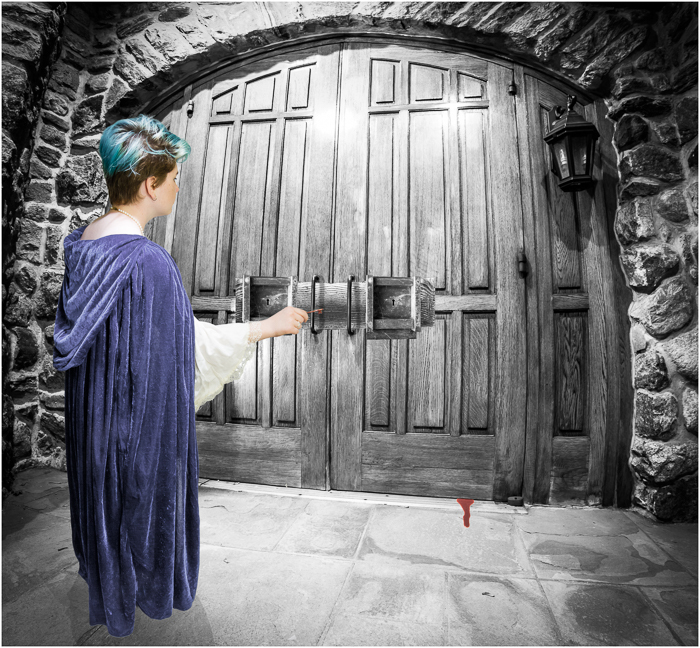 In the example below, an image of the Hitchcock Church door inspired and became the background for a new image in my "Fairytales" series. 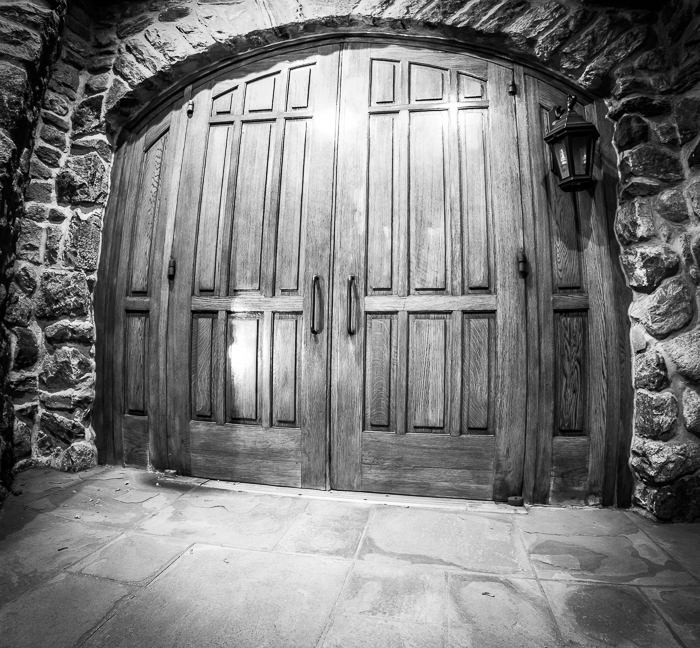 "Hitchcock Church Door"- This image of the church door, taken with ambient light, is a panorama composed from two vertically-overlapped horizontal images. I liked how pointing up and down with the wide-angle lens exacerbated the curvature distortion from the ultra wide-angle. It has the intimate feel of a fish-eye lens. After converting to black and white, this image inspired the creation of a new image in my "Fairytales" series, seen below. Canon 7D, Tokina 11-16mm f/2.8 lens, ISO 100, f/8, 4 seconds. "Forbidden Door"- Inspired by the image above, this image was additionally inspired by the "Bluebeard" fairytale. The model, the blood, the locking mechanisms, the keyhole, and the locking board were all photographed from separate locations and composited in. When I'm light painting a subject, I like to take multiple exposures which are then combined later with Lighten Mode in Photoshop. This has several benefits. The first is that it allows shorter exposures, which helps keep the sensor from heating up and therefore cuts down on long exposure noise. Secondly, and more importantly, it allows me much more fine control of the light on the subject. Finally, by lighting separate pieces, separately, I have a lot more easy control over the look of the final image and can even produce several versions with different moods or emphasis, all from one relatively short light painting session. 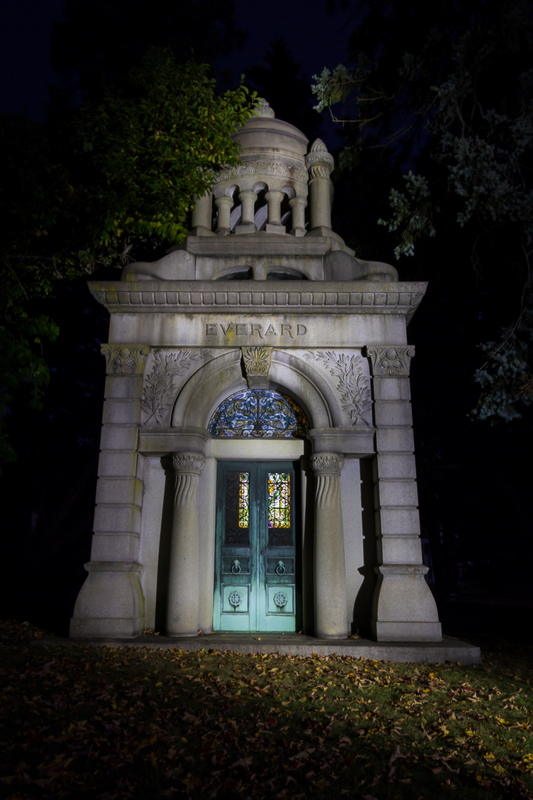 "Small But Beautiful"- While it is a rather compact mausoleum compared to some others in the cemetery, the Everard mausoleum is no less ornate in its structure and use of stained glass. 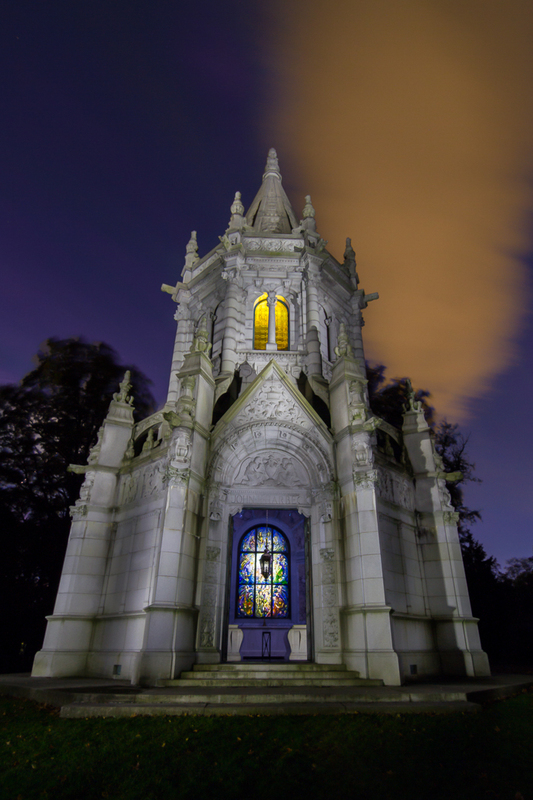 I took three exposures of this mausoleum. In one, I just shone light through the stained glass at the back. In the two others I light painted the front from the left side and the right side. The right side light painting was sufficient and I liked the shadows and detail much better than in the left side exposure. So I only used two images, combined on Lighten Mode in Photoshop to create this image. Canon 7D, Tokina 11-16mm f/2.8 lens, ISO 200, f/16, 30 seconds. As mentioned, Woodlawn includes some historic burial sites, including the fascinating tomb of F.W. Woolworth. "Five And Dime Pharaoh"- F.W. Woolworth is buried in an Egyptian-style mausoleum guarded by two beautiful sphinxes. Canon 7D, Tokina 11-16mm f/2.8 lens, ISO 200, f/16, 30 seconds. Hope you enjoyed the images. If you are a photographer, get out and try some night photography and light painting. You might just find yourself hooked! "Grecian"- A closer view of the ornate door on the Penney mausoleum. It's fascinating how many of the older mausoleums are influenced by ancient and classical art, the resident's "greatness" presumably amplified by the connection with great cultures and empires. Canon 7D, Tokina 11-16mm f/2.8 lens, ISO 200, f/16, 30 seconds.